Tseng,Yu-Chuan. Chia-Hsiang Lee. Ding-Ming Wang. (2009). FLOW- A Flowing Information Interactive Art. Leonardo, 42(1), 98-99. Tseng, Y.-C. (2009). "Program" System of Digital Art:"BOOM! Fast and Frozen Permutation" – Taiwan-Australia New Media Art Exhibition. FYLKINGEN'S NET JOURNA, Hz(13). 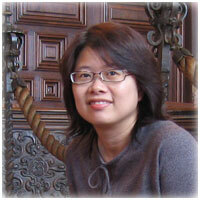 Tseng, Y.-C. C.-H. L. (2008). Who is chatting with you? All Ways-O’s Chatroom. Paper presented at the International Symposium on Electronic Arts (ISEA, 2008). Tseng, Y.-C. C.-H. L. (2008). Flowerman- A robot with the empathy conceiving of understanding. Paper presented at the International Symposium on Electronic Arts (ISEA, 2008). Tseng, Y-C. C-H L. (2005)“Immersing ME-the disappearing digitized presence”, ACM Multimedia 2005 Interactive Art Program, Exhibition paper, p1063-1064. Yu-Chuan Tseng, Antoanetta Ivanova. CHAOS, COMPUTERS, AND CYBORGS: Developing the Art & Technology practices in Taiwan, SEAD: WHITE PAPERS.